The last time we took the Eurostar (chunnel train) from London to Brussels, it still departed from Waterloo station in Central London. Waterloo hosted the international railway platform from November 1994 to November 2007, after which the Eurostar international trains to Paris and Brussels were relocated to the new St. Pancras station, near Oxford Circus and Covent Garden. (Take the tube to Kings Cross St. Pancras station.) 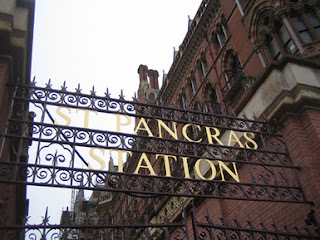 Although I haven’t been to St. Pancras, I imagine it’s a huge improvement over the Waterloo platform, which wasn’t designed for international travel and crowded hundreds of travelers into small areas for both customs and security checks. Another bonus at St. Pancras is a fresh food market just inside the main entrance to the station. Pick up your drinks, snacks or lunch here and enjoy them on your fun ride to the Continent!